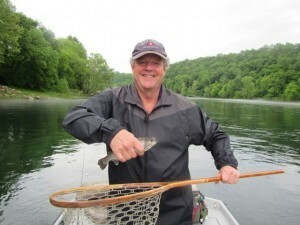 Bo’s brother-in-law, Marc Watson, had a group of lawyers that he works with in Atlanta, Georgia, as his guests at his river house at Reds Landing on the White River last weekend and asked us to come up and help with the fly fishing trips. 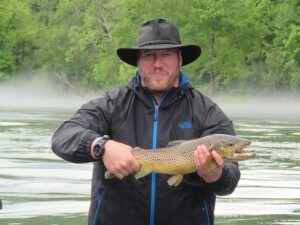 Jeff, Joe and Harris were all new to fly fishing and in spite of tons of rain, cool weather and very high water levels on the both the Norfork and White Rivers all the guys managed to get hooked-up with their first fish on fly. They all managed some nice Rainbow and Brown Trout with #10 Missouri River Worms, #12 RG/PT Cruisers, #12 Gray Flashback Sowbugs and #14 Born’s Hairy Legged Sowbug the top flys. 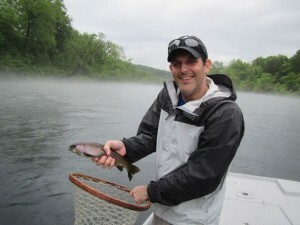 We fished in a steady rain most of the weekend but the guys hung in there and Joe even managed a really nice Brown Trout pictured in the upper right corner. 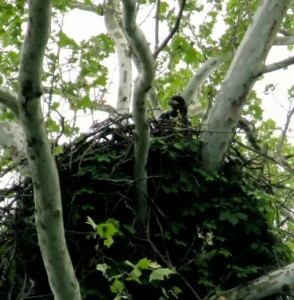 Regardless of the weather everyone enjoyed several really special things starting with the opportunity to see a Bald Eagle chick, or eaglet, in the nest on the Norfork River. Bo photographed one of the adult Bald Eagles in the nest a couple of weeks ago and to get another photo of the offspring Eaglet was really a special treat. Finally some great ribs smoked on the Big Green Egg and a wonderful dinner on the patio at P.J.’s Lodge in the White River topped off a great weekend.